It's difficult being a woman in a man's world. Just ask DC Anna Travis, a new detective trying to fit in and learn the ropes in the new drama Above Suspicion (Set 1).﻿ DC Travis shows up to work in a slim skirt with heels, and is immediately slogging through the mud on her way to view a newly discovered body which has been exposed to the elements for some time. At her first glimpse of the corpse, she turns and is sick in front of her new colleagues. Not the impression she was trying to make, I'm sure. Above Suspicion (the pilot): The investigative team of DCI James Langton has realized that there have been a succession of unsolved murders over the past 8 years that bear similarities: most of the women were prostitutes, all were blond and all were found bound and strangled. The latest victim, however, is a respectable student who doesn't fit the profile (except for her long blond hair). Anna Travis, perhaps needing to make up for her disastrous start, flirts with a suspect and even goes on social outings with him in order to feed him information about the case. Is she putting herself in danger this way? The Red Dahlia: A woman is found brutally murdered and dismembered. At first, the team have a hard time even identifying her. Once they do, they have a hard time unraveling the mystery of her life. She was a mousy, drab girl who transformed herself into a glamorous 1940s-style femme fatale. They learn she had answered an ad about a job as a personal assistant with lots of foreign travel. So how did she end up being London's answer to The Black Dahlia? When another body turns up, it looks like the murderer, like the cases he was copying, has no intention of being captured. This was an interesting and contemporary mystery series. While I enjoyed the stories, there wasn't a lot of "whodunnit" suspense. The detectives generally figured out a suspect fairly quickly, and then through more investigation attempted to prove the case. Anna has a hard time fitting in to the new station at first, but she's given a chance because he deceased father was a well-respected policeman. Her DCI, Langton, continually supports her, even when she makes mistakes, by stating that she must be a good copper, based on her lineage. The thing that I found a little hard to take was the way Langton treated the 3 women officers as his personal slaves. They were constantly being ordered to get him sandwiches, pick up his dry cleaning, bring him coffee and so forth (none of the dozens of men in the room were so ordered around). I could imagine that in a 1970s drama, but I found it a little hard to take in these days of legislated equality. Langton was also old enough to be Travis' father, was obnoxious to women and not particularly attractive, yet we were supposed to believe that there was some sort of attraction between the two. Langton visited Travis in her flat several times, generally banging into her car and damaging it, but she just shrugged it off and never mentioned it to him. So the relationship between the two main characters was a bit odd. Travis herself is also something of a puzzle. In the first episode several of her co-workers remark on the fact that she's worn the same outfit to work two days in a row. Well, she wears it much longer than that -- every single day, as far as I could tell. Not sure what was going on there. Was it a statement about her salary, or her interpretation of how a professional policewoman should look? Another thing I found strange was that in the second story, The Red Dahlia, there was a female character who hit several of the police officers. She was extremely violent, leaving bloody marks on both. Yet she was never arrested or charged with assaulting an officer. No one even seemed to think it was at all odd that someone would turn and begin beating on the officers. I couldn't understand that at all. A main selling point of this particular series, as told in the "behind the scenes" extras, is the authentic-looking models that are used for the corpses. Police and medical consultants were used to make the discovered bodies look as real (and disgusting) as possible. I guess we'll have to take their word for it! Fans of shows such as CSI will likely really enjoy this, too. 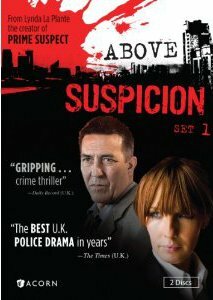 This series of Above Suspicion was shown on UK TV in 2009, with a second series in 2010 and a third in 2011. A fourth series is going to be shown this year. If you like a modern British police drama, with a high gross-out factor, this is an enjoyable series! Final Verdict for Above Suspicion: Three Gherkins, for being an inside look at modern police work -- bodies and all!